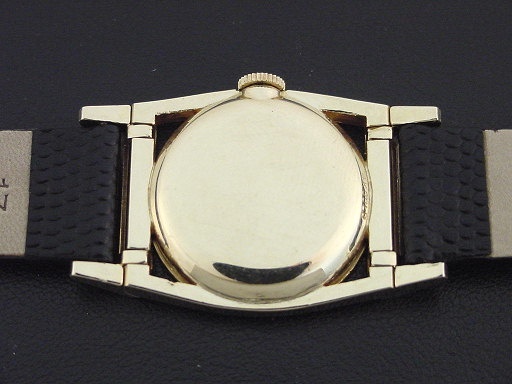 Scarce Hamilton “Piping Rock” men’s Art Deco design wristwatch in solid 14K yellow gold with black enamel bezel, circa 1948. 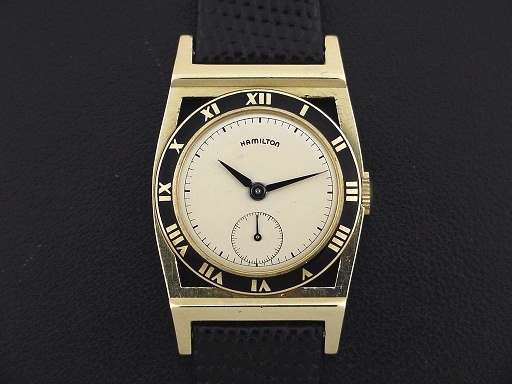 Among the most recognizable and sought-after of all Hamilton wristwatch models, the “Piping Rock” was originally introduced in 1928 and named for the exclusive Piping Rock Club on Long Island, New York, which opened in 1912. 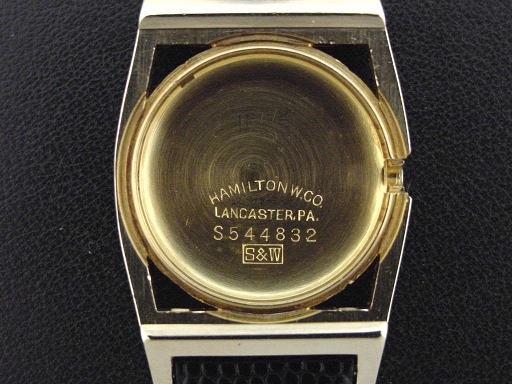 Hamilton introduced this updated version of the watch with a heavier case in 1948, priced to consumers at $200.00. Production quantities on this later version are unknown, but empirical evidence suggests that it is somewhat rarer than the earlier 1928 version. 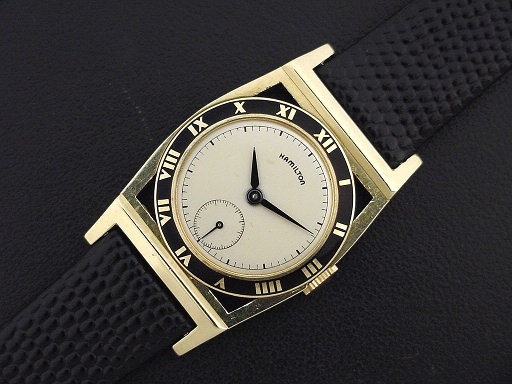 This example is in crisp, excellent condition showing only very light wear. 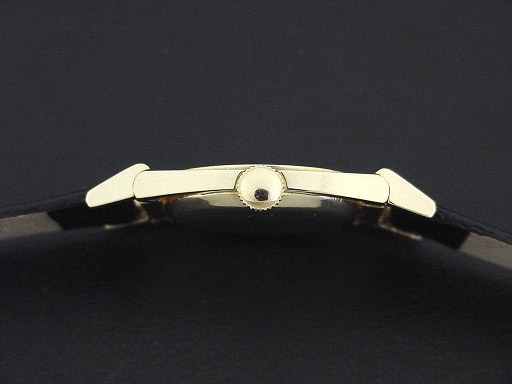 Black enamel bezel is perfect, with no chips or scratches. Lugs flex easily. Caseback is excellent and unengraved, with some light marks. 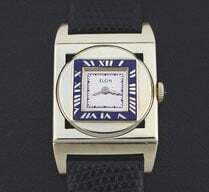 Case measures 42mm long and 28mm wide. 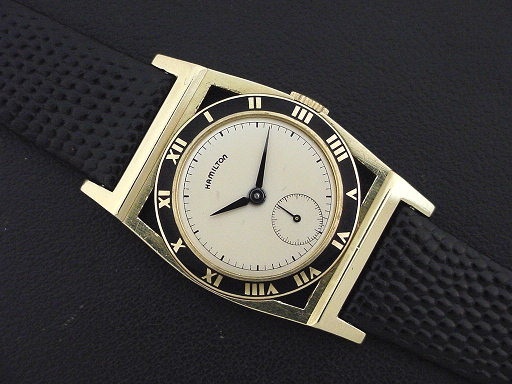 Original dial is excellent. Has new glass crystal. 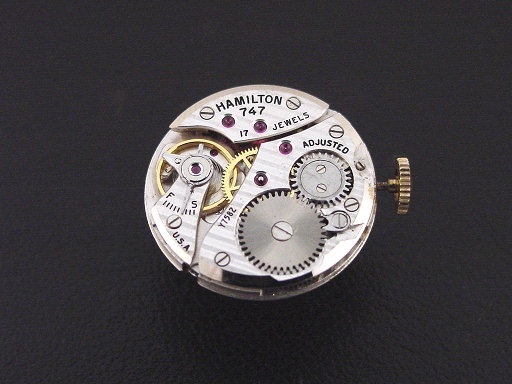 The watch is powered by its correct 17-jewel Hamilton grade 747 manual movement, just serviced and running strong.